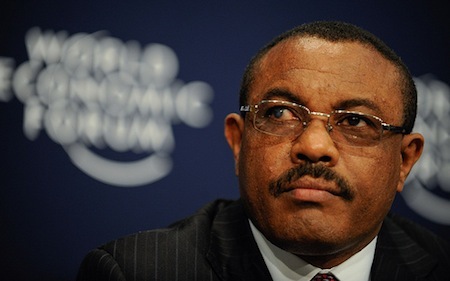 Can Hailemariam retain power in Ethiopia? Hailemariam Desalegn was always a curious leader to succeed former Ethiopian prime minister Meles Zenawi after Meles’s death late in August. He’s from the south when Meles himself came from the far northern Tigray ethnic group (Meles’s rule was itself a derogation from hundreds of years of Amharic emperors in Ethiopia). Hailermariam hails not even from among the largest southern ethnic group, the Oromo, but the much smaller Wolyata group, which represents just under 2.5% of Ethiopian’s population. Hailemariam is also somewhat new to the highest echelons of Ethiopian power — he became deputy prime minister and foreign minister under Meles only in October 2010 after serving as president of the Southern Nations, Nationalities and People’s Region from 2001 to 2006. As a southerner, however, Hailemariam was thought after Meles’s death to have less-than-firm control over the Ethiopian People’s Revolutionary Democratic Front (EPRDF, or የኢትዮጵያ ሕዝቦች አብዮታዊ ዲሞክራሲያዊ ግንባር) as an outsider from the dominant faction of the EPRDM, the Tigray People’s Liberation Front (the TPLF, ሕዝባዊ ወያኔ ሓርነት ትግራይ,), which retains control over Ethiopia’s security apparatus. Hailemariam’s support base lies not among the Tigray ethnic group of the far north of Ethiopia or the previously dominant Amharic ethnic group of the broad north-central highlands, but in the historically less-than-powerful south. As such, when Hailemariam assumed power as interim prime minister in August, few people believed he would last. But he was elected as prime minister formally in September, perhaps precisely because he’s associated with none of the various Tigray factions, which means that he should have some time until the next elections in 2015 to consolidate the office and his power base as Ethiopia’s new prime minister, even as Ethiopia continues to mourn Meles. His first major step, in what appears to be a power-balancing cabinet reshuffle on November 29, was to appoint two additional deputy prime ministers — Debretsion Gebremichael, from the TPLF, is also minister of information technology, and Muktar Kedir, from the Oromo faction within the EPRDF, have joined Demeke Mekonnen, Hailemariam’s first deputy prime minister, who is from the Amhara faction of the EPRDM and minister of education. Hailemariam also promoted Ethiopia’s minister of health Tedros Adhanom to become Ethiopia’s foreign minister. Also a top Tigray official, Tedros has served as minister of health since 2005 and spent part of his childhood and undergraduate studies in Asmara, the capital of Eritrea. He’s attracted international praise for his work as health minister — for example, he won the 2011 Jimmy and Rosalynn Carter Humanitarian Award for his work to reduce HIV/AIDS and malaria in Ethiopia. Despite his obvious qualifications, Tedros is close to Meles’s widow, Azeb Mesfin, who is also a member of the nine-person executive committee of the EPRDF, and is thought to have designs on winning power in her own right. It’s worth noting that this is only the third transfer of power in Ethiopia in the past century — the country’s last emperor, Haile Selassie, came to power in 1928, was deposed in a military-led coup in 1974 and ultimately died in captivity in 1975. The Derg, the Soviet-style commission that ruled until 1991, with often disastrous result, was overthrown by Meles and the TPLF, which eventually morphed into a government dominated by Tigray officials. [The succession] raises questions about how far any new prime minister can reshape the political landscape and has led to open speculation that Hailemariam’s appointment is a calculated political move by and for the TPLF, allowing them to maintain de facto political authority behind a cloak of ethnic pluralism. Meles’ death exposes the dangers of a state built around one man, but he also leaves behind a formidable political machine. For Hailemariam the challenge is whether and how he can manage the machine. Members of competing elites may fight for control of this machine and ethnic movements on the periphery could be emboldened to exploit a perceived power vacuum. As for Ethiopia, its government will face any number of political and economic tasks in the coming years. Perhaps most immediately on his list is a mega-dam project inherited from Meles that began last year — the ‘Renaissance’ Dam on the Blue Nile would restrict water, at least initially, to both Egypt and Sudan, making it a politically controversial infrastructure project, to say nothing of its environmental impact. The world knows little about the dam’s impact because of the relative lack of transparency and openness within Ethiopia’s government. Hailemariam’s administration will almost certainly face increasing pressure from within Ethiopia and internationally to develop greater freedom of speech and press, as well as open the 2015 elections to free and fair participation from opposition groups. Hailemariam therefore inherits considerable economic challenges with big structural issues concerning land policy, the fiscal economy and the cost of living. Ethiopia’s economy will only support major socio-economic transformation if real incomes rise and the provision of education to the masses leads to increasingly non-agrarian-specific careers or other job opportunities. A structural transformation from rainfall-dependent smallholder farming to urbanised economies requiring a more highly skilled urban workforce is needed, and many support factors including a more accessible and open banking system will be necessary to help small businesses to grow…. Ethiopia also faces new challenges and opportunities from China’s increasing interest in Africa, as well as the familiar U.S. interest in stabilizing the radical Islamic threat in the Horn of Africa (specifically, in Somalia), which may become particularly tricker as Ethiopia’s population itself becomes more Muslim and less Christian. Hailemariam’s agenda should also include finding some way to repair its long-strained relations with Eritrea, which have been essentially non-existent since the 1998-2000 war between the neighbors. Previous PostDespite by-election result, UKIP is still a bunch of ‘fruitcakes, loonies and closet racists’Next PostWho is Nana Akufo-Addo? And how would he govern Ghana?